Winner of 2014’s Readings Bookstore New Australian Writing Award, Ceridwen Dovey’s second novel is best described as a variety of short stories and letters. Less than 250 pages, this book’s rich stories peak to everyone. 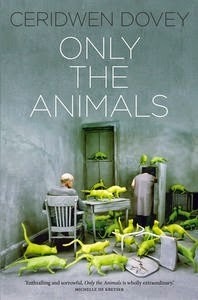 In Only the Animals, ten animals are caught in human conflict that ranges from a camel who was in the presence of Australian author Henry Lawson to a letter written to Sylvia Plath by a dolphin. With each story, readers glimpse into the hearts of the animals that stoically stood by their owners or, like their owners, dreamed of a better life. Giving a unique insight into the animal psyche, these stories reveal the raw suffering and joy that the real heroes experienced like losing a loved one or the fear of uncertainty. Dovey has a unique ability to make well-rounded and lifelike characters. For example, “Pigeons, a Pony, the Tomcat and I,” set on the Western Front, is a story about a cat reminiscing about her owner’s life in Paris. There, the actress was known for her theatrical antics, and the cat remarks, “… how entranced Collette would be by this little scene…” like walking her on a lead around town. A more touching story in this collection is “Plautus: A Memoir Of My Years on Earth and Last Days in Space,” in which a soul of a tortoise writes about Virginia Woolf’s life by replicating her essay A Room of One’s Own with one segment called “A Terrarium of One’s Own.” The tortoise remembers when Virginia discovered him in a box. The tortoise says that “she had done what she usually did when she encountered a new phenomenon … and went to literature.” This story provides an alternative look at a writer, who was living through social change at the time of writing her piece. A Room of One’s Own was her stating that she did not wish to be just known as a house wife, wanting a place where she could write and devote herself to her work. For the time where men hold the balance of power this was a stand for women’s rights. Only the Animals is a beautiful piece of literature that makes readers ponder the lives that these animals and authors may and lived. Dovey seems to ask whether readers can understand an author better by looking at the symbolic use of animals within their work. For example, Kafka symbolised disability and the feeling of helplessness through the representation of being a cockroach that has fallen on his back and is unable to be righted. She also postulates whether animals can return feelings we wished we received from other humans: unconditional love? Only the Animals seeks out the empathy in everyone, whether it be for animals, humans, or for both. It all but hands a typewriter to a beloved pet.